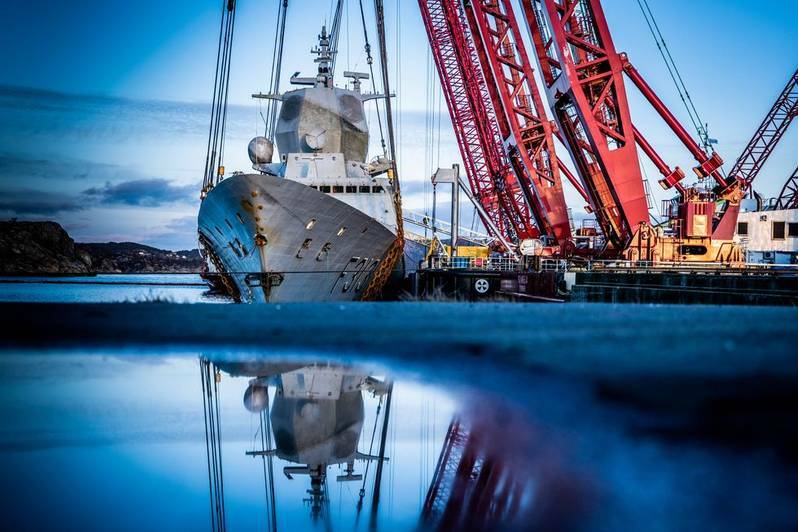 Salvors used a unique lift method that combined two heavy lift vessels and four cranes to raise a Norwegian frigate that had become partially submerged following a collision with an oil tanker off the coast of Norway in November. On November 8, 2018, Norwegian heavy frigate KNM Helge Ingstad collided with the tanker Sola TS near Bergen, and sank on the inclined slope of a fjord. The accident injured eight people and caused the temporary closure of the Sture Oil Terminal near Bergen and the nearby Kollsness gas-and-condensate terminal, as well as several offshore fields. 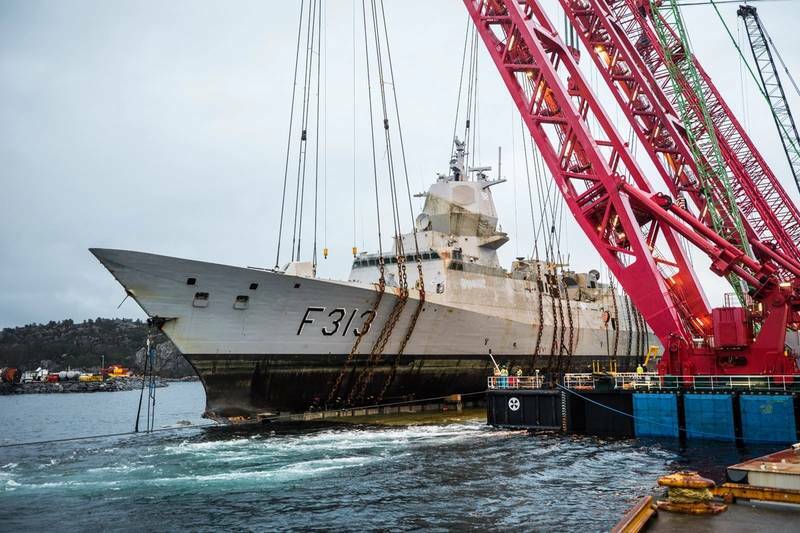 In order to lift the frigate safely and in one piece, Belgian salvage specialists Scaldis said it developed a lift method especially for this project, after it was called on by the Norwegian Navy to work alongside another salvage company BOA. The salvage technique, which Scaldis calls the "Double Duo Lift method" combined two heavy lift vessels - Rambiz, equipped with two cranes and a total lifting capacity of 3,300 metric tons, and the new heavy lift vessel Gulliver, also with two cranes and a total lifting capacity of 4,000 metric tons - creating a total combined total lifting capacity of 7,300 metric tons. 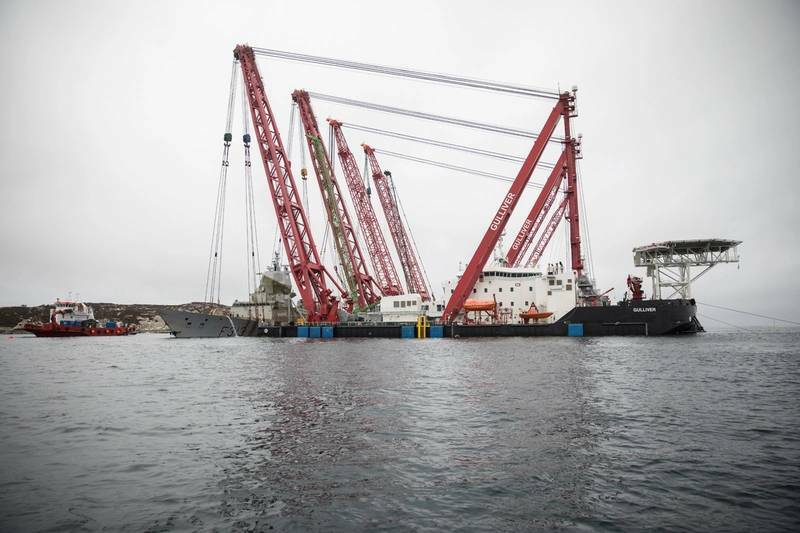 The method allowed the salvors to lift the 133-meter long and 5,500-metric-ton heavy frigate in one piece, and the synchronous functioning of the four cranes allowed workers to lift the wreck in one continuous operation and move it into a horizontal position, Scaldis said. The lifting operation started on Tuesday last week and was completed by Sunday. 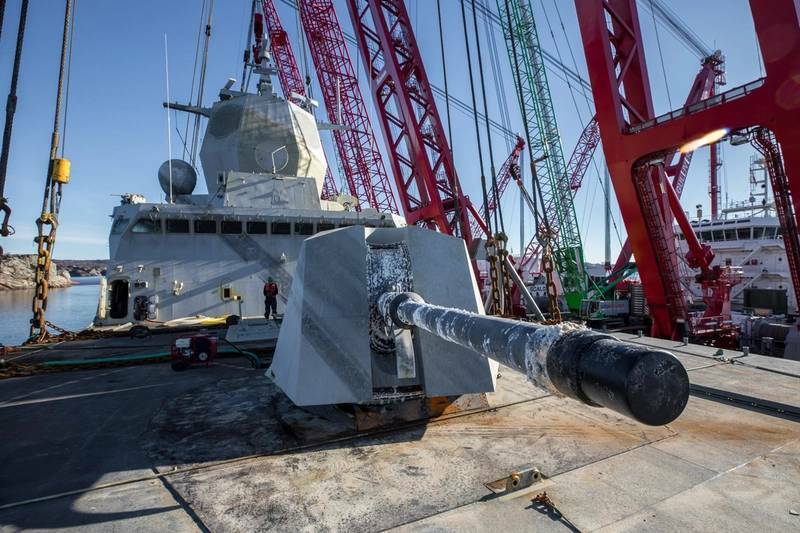 Scaldis, a subsidiary of DEME, Jan De Nul Group and Herbosch-Kiere, said missiles and fuel had already been removed from the frigate during the winter months while divers installed 16 hoisting chains under the wreck to be able to lift the ship out of the water. 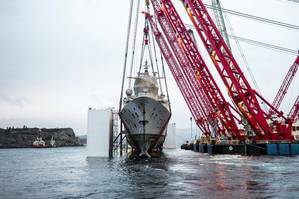 To lift the frigate safely and completely out of the water, it was transported while hanging from the crane hooks of the heavy lift vessels to the nearest port, where it was placed on a submersible pontoon. The partially submerged pontoon was subsequently de-ballasted, allowing it to re-emerge above the waterline while supporting the Helge Ingstad at its center. During this operation, the hoisting cranes stabilized the ship until all sea-fastenings had been secured for subsequent transport. Helge Ingstad was brought to Semco Maritime's yard facilities at Hanøytangen ahead of transport to the Haakonsvern naval base.